Keys Are The Sure Way To Build Songs! Keys seem to be the hidden ingredient to playing a guitar. Once you know keys you can immediately start playing the chords in the key and constructing songs based on the chords in the key. Triads are the simplest chords you can create and they flow up and down the fretboard providing easy access to any chord in any key with hardly any effort. And when you are constructing a song, there is no better tool available anywhere. And the knowledge you get will set you free! There is nothing like it and nothing that can make composing songs as easy as this. For $20, you can have a resource that will always show you all the choices for where you are working. Pick up a copy today. At the heart of every rock and roll song you will find fifths. Fifths can also be the backbone of the Twelve Bar Blues. I have known many guitarists that have started out primarily playing rock songs centered around fifths and they are still at it. The fifth is tied to the hip with theory just like anything else. And when the theory of keys is applied to fifths, some truly useful information will come from it. First of all fifths are constructed of at least two notes, the first degree and the fifth degree of a chord. Together these two notes comprise a fifth. The first diagram is the typical form a fifth will take. 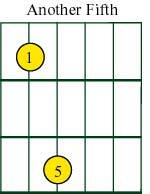 You can play this form anywhere on the fretboard. This form is played using the E and A strings (the two fattest strings). Below you will see another type of fifth generated by a common barre chord. The fifth is actually two notes of a common barre chord. The barre chord is shown here as a C major chord. Notice the yellow notes are exactly the fifth shown in the first diagram. Also notice these notes in this chord are the first and fifth degree. Do you see the rest of the notes in this chord. 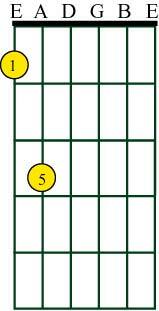 This is the full barre chord that generates the fifth. Here is another common way to play a C major barre chord. This form will also generate a fifth (show below). To a large extend fifths are interchangeable with the full chord. 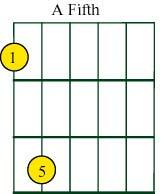 Whenever you use the barre chord form, you could in many instances, actually slip in a fifth instead. This becomes very powerful when we examine the key and apply this information, which we will do in a few minutes. But first lets back up and talk about the foundation we started to put in place regarding keys and chords. Remember back to last month, we discussed the key of C major and we actually built the chords in the key. We are now going to use that information to actually do something useful. We are going to diagram out these exact chords as they fall into place with the diatonic signature, the key of C and one of the barre chord types discussed above. We will use the chords in this chart (below) to show how they cascade through the key. Here are the chord forms we will use. 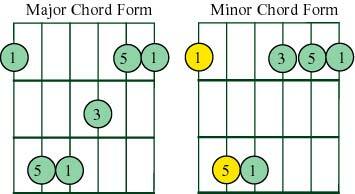 We are going to use two barre chord types, the major and the minor form. The first one is the same form we used to construct C major above. The second form is the same chord only the third degree has been lowered. This creates a minor form. Refer back to last month if you need to go over the details of major and minor chords. So we are now going to apply these forms to the key of C and show them cascading down the fretboard. For this we will use the diatonic signature. 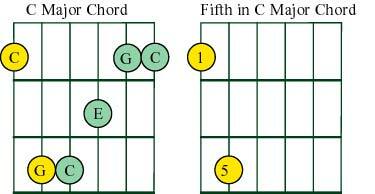 Cascading is a term I use to describe the natural order of chords in a key flowing up or down a fretboard. Remember this: the diatonic signature is constructed by mapping out all the notes available to the key of C. Do you remember when I said all the chords in the key will be present inside the diatonic signature? They are, and we are going to examine a small subset of the total chords available in the key. Here is an example of the diatonic signature for the key of C major (on the left). Remember that all the notes for the entire key of C are here. This also means all the chords for the key are also present. This is very helpful for understanding how things work in the key. Now look at the example to the right. Notice it is the same twelve fret signature as to the left, but now we are highlighting chords that live inside the structure. In this example we are only using one form for the majors and one form for the minors. There is also one oddball form for the diminished chord in the sequence. The overwhelming point in this example is the different opportunities for using fifths in a key. Each one of these chords has a fifth attached to it as a part of the chord. Any time you are working in the key of C major, you can use these chords and these fifths. Much of the time when a song is created in the key of C major, these fifths will become the backbone of the song. Now all you have to do is figure out what progression inside the key you would like to work with. The possibilities for song creation are almost unlimited. And remember in this example we are only using the two forms. You can use this exact signature and plug in the other barre chord example above. It will fit right in and more options can be incorporated. Remember when you see the diatonic signature, all sorts of concepts related to a key will flow through it! Anything that can be worked out theoretically for a key can be expressed using this signature. Literally everything in a key can be examined using this diagram. This way of examining the fretboard has some very useful side effects. Every key will use this exact signature for everything that happens in the key. So it serves as a mental road map for all keys. Everything you learn in one key can be used in every other key will no alteration. This signature will help you to understand the similarities all keys have in common. Make sure you notice this! 1. The chords cascade in order in the key. Start with the C major chord. Notice the next chord is D minor, then E minor. Then F major, G major, A minor and B diminished. B diminished is shown but the chord is not illustrated on the side. 2. Notice that after D minor, there are no more chords. But E minor starts at the first fret. 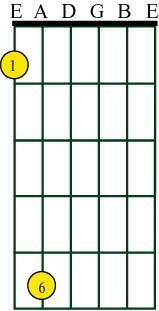 The twelve fret signature repeats every twelve frets. It is circular! It wraps around and picks up at the beginning. 3. Although not shown, this progression also continues past the twelfth fret! It will cascade right up the fretboard. 4. Think about this. At the same time all this is happening, you can find every scale fragment in the key of C major and A minor natural right here in this signature. And that is the topic of next months newsletter. This truly explains everything that happens inside a diatonic key. Parting comments. Fifths are often played with additional notes. This first diagram is of a standard fifth. The second diagram is another chord (a sixth) that is often played as an extension of the fifth. Try it and see. Only play two notes per form. Play around with this a little, and you will hear some standard rock and roll sounds develop. Try a downward striking motion and strike each form two times, then move to the other chord. 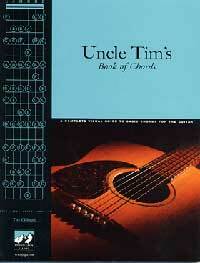 All of this is covered in detail in Uncle Tim's Book of Chords.